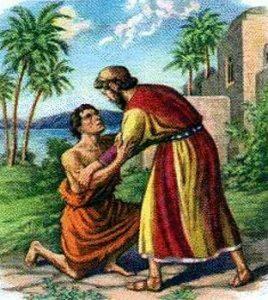 Today’s gospel story of the Prodigal Son is one of the best known and powerful illustrations of God’s mercy and forgiveness in Sacred Scripture. It is a story that reveals the depth of the love of God to us. We know that it is much more than a story of a son leaving home, squandering his resources and life by reckless and sinful living. The father describes his younger son as dead, and has come to life again, he was lost, and has been found. The son tells the father: Father, I have sinned against heaven and against you, I no longer deserve to be called your son. The son recognizes his sinful behavior and repents – makes a confession to his father and asks forgiveness. How does the father react? Perhaps, much to our surprise… with mercy and overwhelming love and sees the reconciliation of his son as a cause for an incredible celebration. We can only imagine the rejoicing of God the Father, Son and Holy Spirit when a sinner with a contrite heart seeks forgiveness in the Sacrament of Reconciliation. God welcomes us home, no matter the magnitude of the sins or how many sins. Just like the father in this parable, God is waiting for our return, looking down the road even though we may be a long way off. Perhaps we can identify at one time or another with all three characters in this story…like the prodigal son, in need of forgiveness… like the father, granting unconditional forgiveness and like the older son, holding back forgiveness. St. Paul tells us in the second Letter to the Corinthians: Whoever is in Christ is a new creation: the old things have passed away; behold, new things have come. This Lent, let us seek God in His mercy. May His grace received, especially in the Sacrament of Reconciliation and the Holy Eucharist enable us to live a life in Christ.